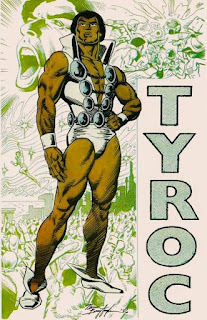 PYRO.BLOG: NuPerspective Black History Month: Day 12- TYROC! Today's character is the reason Nu-Perspective exists. I give you DC's own TYROC! Story: Marzal Island is a separatist colony of Earthlings of African descent, who centuries ago isolated themselves from the rest of the world in a pocket dimension out of sync with reality. With the rise of the United Planets, a noble effort to bring solidarity between all races and species across known space, Marzal sent one of its champions as their ambassador, Troy Stewart. Enrolled in the prestigious Legion of Superheroes, Troy adopted the codename “Tyroc” which in Marzal means “Scream of the Devil” due to his exceptional acoustic powers. Despite his prejudicial upbringing, Troy is emboldened by the Legion’s creed, and learns to work side-by-side with non-Marzalian humans and even extraterrestrials. His years of valiant service proved Tyroc to be a formidable member and capable leader. Eventually however, the prejudicial shortcomings and the political and judiciary restraints on the Legion became begrudgingly apparent. 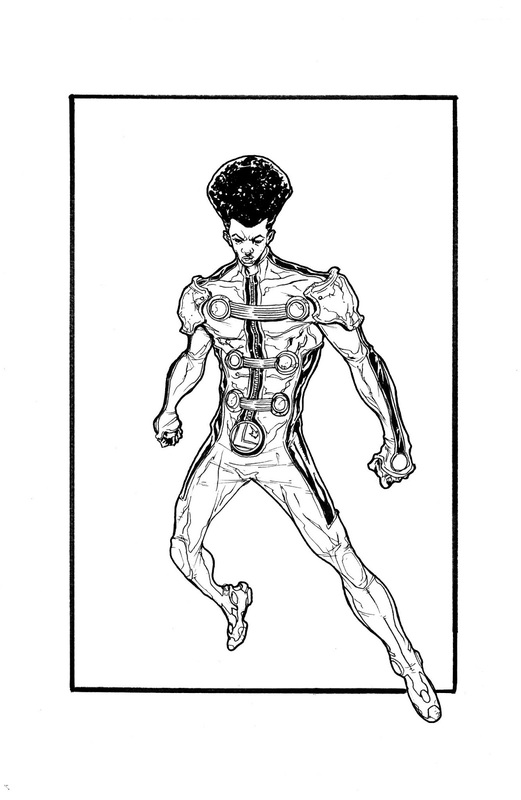 Tyroc recently returned from the 21st century on a secret suicide mission, and approached Brainiac 5 for a solution to exact justice across the known cosmos without tarnishing the Legion’s reputation. With Brainiac's blessings, Troy enlists some of his most trusted Legionnaires to create a special task force to deal with threats too dirty for Legion hands known as R.E.B.E.L.S. Powers/Abilities: Tyroc possesses uncanny acoustic-kinesis, on an unparalleled scale. His power’s most common usage is a powerful shriek of concussive sonic energy that can level buildings, disorient or even incapacitate foes. However, Tyroc can mainulate his sounds to manifest, among other things, pyrokinesis, teleportation, psychokinesis, aerokinesis and weather manipulation. Another auxiliary ability includes a sonar sense. His mastery over his power is so precise that he can to “spit” a puff of wind like a bullet, and manipulate ultra and infra sound to subtly influence those around him or liquefy solid matter. He can also inadvertently use this power as a means of self-propelled flight. Tyroc is in peak physical condition, and has undergone training with the Karate Kid. With his body having greater enhanced stamina and lung capacity than a normal human, and reinforced inner-ear tissues. Paraphernalia: Tyroc has a standard-issue Legionnaire’s membership ring that grants terrestrial and extra-terrestrial flight, as well as a self-contained, nigh-impenetrable force field courtesy of Brainiac 5’s technology. The ring also has a built-in communication and tracking device, and universal information repository. What do you like most about the character? 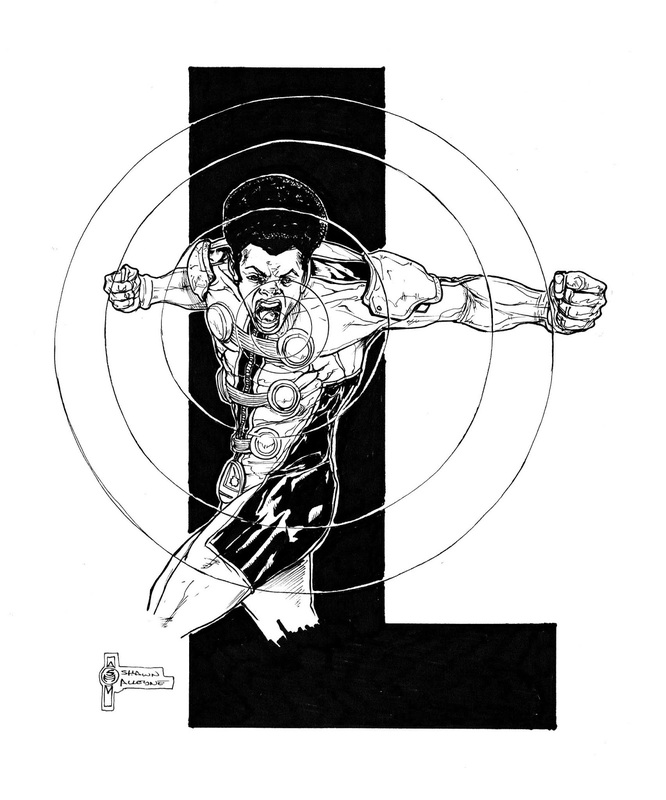 - Fabian: The first Nubian member of the Legion of Super-heroes was unflattering and unappealing in his debut; from his attitude to his stripper-esque costume (par for the course at the time for Legionnaires). DC really dropped the ball with this guy and never picked it up. 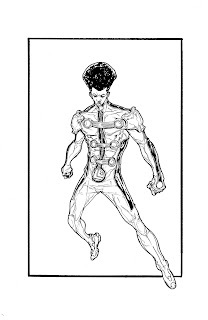 Even the half-hearted attempt at making him a member of a time-displaced “Legion Lost” during the first wave of New 52 comics wasn’t enough to properly salvage this character. He needed to be treated with due respect and attention. Shawn: After reading up on him his power set really impressed. He is a POWERHOUSE!! I don't think people really know. What made you choose this character?- S: Have you SEEN his original look? Like Fabian said, that macho stripper look was NOT cutting it. Even though they had updated his look I still wasn't 100 feeling it. What was the creative process like for this character? - S: I had originally drawn Tyroc as a sketch for someone (see second piece) and did my take on him based on his comic book redesign. So when it was time to include him in Nu-Perspective I already had a working concept. Did the character pose a challenge to update and if so what was the hardest part of the redesign? - It wasn't too hard. I liked what they did with it in the comic and added my twist. In hindsight is there anything you would do differently now? - Once again, just the pose. In regards to the story aspect of the update, what was your main inspiration for the direction? F: The challenge came from making him more relatable (and giving him a more visually appealing/respectful costume…thanks Shawn). Playing up his in-bred prejudice and learning to overcome it is endearing and inspiring. The fact it’s coming from a Black person was also interesting. I think we also wanted him to take a more prominent role in his team without overshadowing the de facto Trinity (Cosmic Boy, Lightning Lad and Saturn Girl), so we went with an… “Outsiders” approach and incorporated another acronym team with ties to Legion to let him have is own space :P to grow and prosper.